The SBLCL (Surface Based Lifted Condensation Level) is the pressure level in which saturation will occur when air is lifted from surface. 2. How is SBLCL determined? Locate temperature and dewpoint that is at the surface. Raise this air at the dry adiabatic lapse rate. Temperature will cool 10 C/km while dewpoint will decrease 2 C/km. Once the temperature and dewpoint become equal then the LCL is reached. 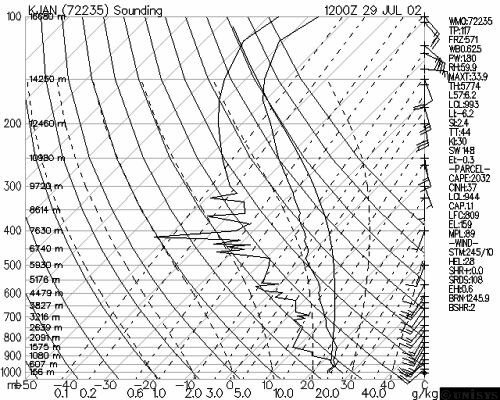 The LCL on the sounding at the bottom is located at 993 mb. Tornadoes: An LCL closer to the surface is more supportive of tornadoes in a severe thunderstorm environment. This is because the region of +CAPE (region where buoyant rising occurs) is closer to the surface. Cloud bases: A low LCL will result in cloud bases closer to the earth's surface while a high LCL will result in cloud bases higher aloft from the surface. A low LCL represents higher relative humidity in the PBL.